Ultra fetish lace up thigh boots with wedge high heel of 20 centimeters. Full length zipper with platform. WARNING: these boots have a really high tapered wedge heel. Please be careful when walking in these boots. 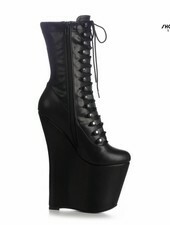 Sizing for the Giaro MISTERY style with platform (all sizes in centimeters and Italian woman sizes). The MISTERY style has a normal foot length. Ultra fetish thigh boots with a thin gold metal high heel of 20 centimeters. Full length zipper with platform. Ultra fetish lace up knee boots with wedge high heel of 20 centimeters. Full length zipper with platform. Ultra fetish lace up ankle boots with wedge high heel of 20 centimeters. Full length zipper with platform.